EIC and NRA service pistol rules are not the same any more?? Has the NRA updated the conventional pistol rules for 2015? I can only find changes made for 2014. I noticed that the CMP and NRA service pistol rules are no longer the same since CMP rules changed and NRA hasn't. NRA still specs Ball ammo at 230gn FMJ only and CMP is any safe Metal Jacket. Re: EIC and NRA service pistol rules are not the same any more?? EIC matches are governed by the CMP their rules for the EIC matches - rule. Yes, I am aware of the EIC leg match rules, but there are also NRA Service Pistol matches and championships that use the NRA rules. These rules used to be the same as the CMP rules but since the CMP changed the equipment rules they are no longer the same. NRA still specs 230gn FMJ and CMP does not. CMP has relaxed the pistol equipment rules some and the NRA has not, unless there is a 2015 NRA rule change update like there was in 2014. I never seen an NRA Service pistol match, only CMP service pistol, NRA does run the Distinguished Revolver match. The NRA rules even refer to the EIC or leg matches (which are CMP) and defers to their rules. The NRA rulebook has not caught up to the changes CMP has made. Yeah that's what it looks like. The NRA Rule quotes the CMP rule and then refers to it for details. So I guess I should prepare for the match using the CMP EIC rule? yes that would be what to go by. Most match bulletins define the rules that will apply for that particular match. Rob Kovach wrote: Most match bulletins define the rules that will apply for that particular match. They do, but simply that the NRA service pistol match will go by NRA rules and the leg matched by CMP. Thank you for the email and your question. I did a little research, and CMP did change their rule book for 2015. The rule book for NRA Pistol online is dated 2014, so that’s likely why the reference is still in there. CMP is a different entity from the NRA, and likewise, so are their matches. To the best of my knowledge, the EIC Leg Match is run in conjunction with matches sanctioned by the NRA, but they have their own rules. If the CMP rules change, then the new rules are the ones to follow. However, the rest of the tournament/championship that’s sanctioned by the NRA may fall under another requirement. NRA Distinguished Revolver is very particular, for example. Please feel free to call or email us here if you have any questions. I have never seen an NRA sanctioned "Service Pistol" match, maybe that is the confusion. When the NRA references Service Pistol it's always about EIC or Leg matches and they refer to the CMP rules. (d) CPRPFS (‘’Leg’’) Matches - The Corporation for the Promotion of Rifle Practice and Firearms Safety (CMP) sponsors Excellence in Competition (‘’Leg’’) Matches that are organized and conducted under the direction and rules of the CMP in conjunction with NRA Regional and State Championships. In addition, the CMP authorizes the NRA to conduct the National Trophy Matches in conjunction with the NRA National Championships. The combined events are titled ‘’The National Matches’’. All CMP matches are conducted in accordance with rules and regulations contained in CMP Competition Rules & Regulations in its current form. They are not NRA Sanctioned Matches, and scores are not used for classification. Dave is correct, the clubs have to seek CMP approval to run EIC matches not the NRA. In years past the DCM (now CMP) and the NRA were in lock-step together. Seems that when Anderson got involved there was some seperation. Not sure if there is a divorce in the future but Anderson was an International Shooter not Bullseye. 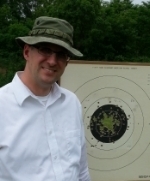 At our club we did run Service Pistol Matches, they had nothing to do with the DCM or CMP. It simply may have been a sanctioned 1800 and the club required the use of a service pistol. Scores were used by the State Association to select the Service Pistol Team to enter the CMP run Service Pistol Team Match at Camp Perry. Anyone shooting the EIC matches need not be a member of the NRA. So there might be a gray area in who may compete in a service pistol match if it's used to select CMP team members. In Phoenix Arizona during the February Desert midwinter match we shoot an NRA registered service pistol 900 match. C.Perkins wrote: In Phoenix Arizona during the February Desert midwinter match we shoot an NRA registered service pistol 900 match. What were the ammo requirements if you remember? Did they just use the CMP leg match rules? At our club the match was CMP team selection. All was as per CMP rules, Iron sights, 4 pound trigger, Ball Ammo, Guns inspected before the match and trigger weight tested. Those wanting to shoot along for practice could with any gun but exempted from team selection and awards. I was just asked to shoot for the Oregon service pistol team at the Nationals next year (Oregon has not had a team for about 30 years) Would the service pistol team matches be NRA or CMP rules? Or, is a whole year away to soon to tell? OldMaster65 wrote: I was just asked to shoot for the Oregon service pistol team at the Nationals next year (Oregon has not had a team for about 30 years) Would the service pistol team matches be NRA or CMP rules? Or, is a whole year away to soon to tell? The P100 is a CMP event, there isn't anything in the CMP rules that says it's different than the new rules that were just published. "The 2015 19th Edition of the CMP Competition Rules for Service Rifle and Service Pistol governs CMP sponsored and sanctioned matches for Service Rifle, Service Pistol and .22 Rimfire Pistol events, including National Trophy Rifle and Pistol Matches, Excellence-In-Competition (EIC) matches and other CMP-sanctioned competitions." The NRA Service Pistol rules were not changed. We do occasionally sanction Service Pistol Championships. Michigan, my home state, usually hosts one each year in Taylor, Michigan south of Detroit. One was just held at the Inter Service Championships as well.